I’ve personally been fortunate to have found myself over the years withinÂ Brad Nierenberg’s group of Supporters. What does that mean? Well, Brad, is not only the CEO of RedPeg Marketing, a prestigious national experiential marketing firm headquartered in Old Town Alexandria, VA which boasts a client list ranging from Verizon, to Bud Light, to Twitter, TD Bank, to Mercedes Benz, to Enterprise and more, (and he’s extremely well respected in the YPO, entrepreneur, and business leader space) he is also the founder of Chance for Life, the annual event that brings together hundreds of poker players for charity. So, I’m a supporter of what he does, but moreover, a fan of why he does it. The guy is humble, so humble, he’ll ask me to stop writing about him and move toward the cause itself, (ok Brad, I will do so!).. Chance for Life, which is Saturday, February 27th,Â was inspired by Kennedy, who was stricken with a spinal cord tumor at age 2. Brad, being friends with her parents sought to help in the best way he could, which was raise money to help with surgeries from his extensive network. Over the years, as Kennedy went through painful cancer treatments, not only did the group grow to help her and her family, but the event exploded to an all day poker tournament, wine tasting and after party. It grew so big, it had to exit the original home in Georgetown’s City Club and move to the Sphinx Club last year for the 10th anniversary. But this hasn’t been just about Kennedy and her brave journey, it’s about raising big money for Alex’s Lemonade Stand Foundation for Childhood Cancer and Spinal Cord Tumor Association, Inc. She humbly attends every year and thanks the sponsors, players, guests for continuing to be there for every child and family member affected by the disease. 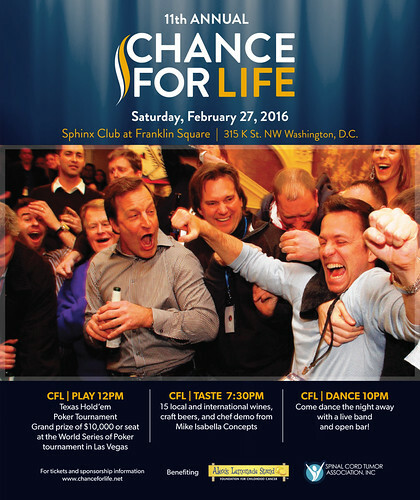 Make sure you follow theÂ @ChanceforLife Twitter PageÂ UseÂ #CFL2016 and Like the Facebook Page. Join in as much as you can, early and often! Keep in mind that these prices will go up onÂ Friday, January 22Â and again onÂ February 6, so the sooner the better! Thank you again for being a part of a Washington, D.C. regional tradition that started with a sincere effort to help a small child 11 years ago.